The barrage of rocket fire coming from the Gaza Strip reached far beyond the known range of Hamas’ missile arsenal, hitting the Northern Israeli town of Hof HaCarmel on Wednesday. The town is just south of Haifa, Israel’s third-largest city. Hamas claimed responsibility for the attacks and said that Haifa was the intended target. Hof HaCarmel is located on the Israeli coast more than 90 miles north of Gaza. It is the farthest north point a rocket from Gaza has ever reached. The new demonstrated range of Hamas missiles from Gaza puts nearly the entire population of Israel in danger of being hit by rocket fire. Israel’s two most populated cities, Tel Aviv and Jerusalem, have also been targeted in the past 24 hours, during which nearly 200 rockets have been fired from Gaza. Iron Dome, Israel’s advanced missile defense system, has intercepted many of the rockets, including multiple fired at Tel Aviv. 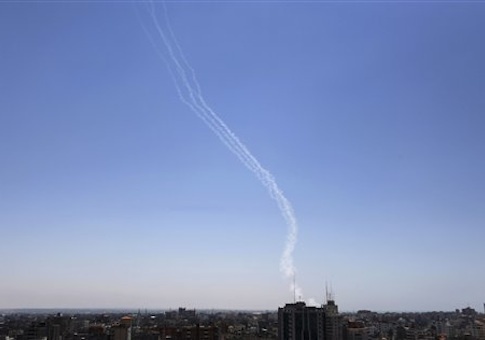 Iron Dome continued to intercept rockets over Tel Aviv throughout the day. Footage of Iron Dome intercepts has been captured throughout Israel and made available on social media. The extent of the Hamas rocket fire has forced Israel to expand its deployment of the Iron Dome system to Jerusalem, which previously was unprotected by the system. The cost of Iron Dome expands each time a rocket must be intercepted, forcing the system to make a decision each time a rocket is detected. Each of the Tamir interceptors fired by Iron Dome to shoot down rockets headed for populated areas costs an estimated $100,000. A rocket made contact in Jerusalem prior to the expansion of Iron Dome to Israel’s capital city. In response to the increased rate of incoming fire from Gaza, Israel Prime Minister Benjamin Netanyahu has ordered the Israel Defense Forces to intensify the ongoing air strikes targeting Hamas. "The IDF is prepared for all possibilities," said Netanyahu. "Hamas will pay a high price for firing at Israeli citizens." "This operation will continue until calm and quiet return to the area," pledged Netanyahu. The Israeli operation named Protective Edge is aimed at destroying the terror infrastructure that has been built up within Gaza. "We are destroying arms, terror infrastructures, command systems, Hamas institutions, regime buildings, terrorists' houses, and killing terrorists of various ranks of command," said Israel Defense Minister Moshe Ya’alon.